".......I have found Eva and Chris to be very knowledgeable and experienced with all types of horses, boarders, and riders. The condition of the property and all the horses reflects true dedication and concern by Eva and Chris........"
".......My three horse received excellent care during their stay. The facility provided a very healthy atmosphere, both physically and emotionally , for my horses, as they were able to socialize with a group of gentle horses while grazing in a large area. Eva maintained a farrier, worming and vaccination schedule to ensure that all health needs were met. For horses that experienced injuries, she provided more intense nurturing. Eva's trailering service to the mountains was the highlight of my boarding experience ! I learned more about horses from Eva than from anyone else in all the time I've owned horses. She taught me how to encourage a horse to cross water, how to ride down steep hills, and how to read my horses emotions. 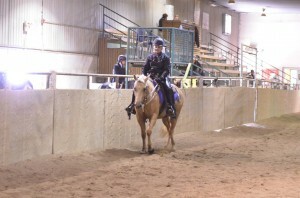 I developed confidence in my riding abilities and trust in my horses abilities. She taught me to be a better horse-person. Eva did an excellant job training my 2-year old colt. She was able to be consistent and gentle so that Ben responds to the slightest cues and is a willing and happy partner. It was an amazing experience to ride Ben in the mountains for the first time, with Eva providing the encouragement. I highly recommend Caeco Ranch to anyone, novice or experienced.........."
".......Regarding our favorite 6 year old gelding Shaker, he is doing great. Since bringing him home from your training, we have never looked back......There is an interesting bond between a little girl and a horse that I can't seem to replicate. We had a feeling he was the right horse when we bought him from the rescue facility but we still had misgivings as to how well he would train up. We really appreciated the time you took to explain what would happen and what we could expect to see throughout his development. Being an Arab cross, we had ample chances to see how sensitive he was to external stimulus and perceived threats. Watching you work with him and seeing the trust develop, was inspiring for us (as well as confidence building). 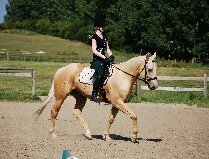 We were amazed at the transformation in such a short period of time, evolving from a heard bound horse with little interaction for over two years, to one that Maggie was riding less than a month later. You have our sincerest thanks for starting all of us down the road together........"
".....'You're the greatest boarding facility I know ( & Sonnet and I have known a few over the years!) ...........Thanks for the great care for Duke and Sonnet......."
I just wanted to say thank you so much for my beautiful blue eyed Paisley. Your ability to match horses to humans is incredible, at first he seemed a bit much for me and as time went on and my trust in him grew as it also did in myself, it grew into a relationship I intend to hold onto for as long as possible. All of his characteristics that I’ve learned so far are truly a mirror of my own self. It took a while but as time went on he has grown to know the man I am and the things that horses teach us all, he trusts my good natured, kind heart, patient ability to ask only for what is possible and take it as slow as necessary. Now looking at the relationship we have I know he has trust in me and my actions and requests. He has always been a kind and respectful horse and I know it to be no secret who taught him that humans are for the most part good beings. 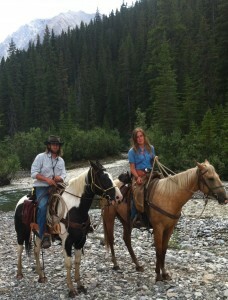 We spent the summer together guiding out in Kananaskis Country taking people on adventures getting them out of the city and getting the horses out of the paddock which as we all know is so truly beneficial for the spirit of all animals. It was very rewarding for me to use my friend in this manner and look forward to many more tales on the trails in the future. To anyone looking to buy a horse I strongly recommend Caeco as it is not in their agenda to sell you a horse but to find the right companion for you. So thanks again Eva and Family for doing what you do so well. I returned to Caeco Ranch to purchase another yearling because the temperament is without question the best I have seen. A lot of imprinting and commitment are put into the foals from the very beginning which provides a solid foundation for furthering the training experience. In addition you’ve got great confirmation, superior bloodlines that would suit any discipline, and the passion that stands behind their brand. I have complete trust in dealing with Eva and Chris.